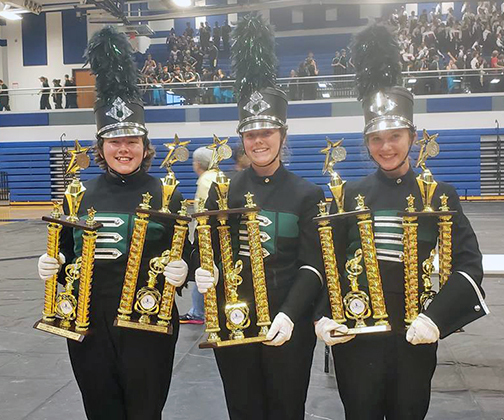 The Pride of Pattonville marching band and color guard was named overall grand champion and earned a number of awards after competing at the 38th annual Francis Howell Marching Invitational on Oct. 6. During the preliminary round, the band and color guard won the division championship, as well as best music performance, best visual performance, best general effect and best percussion. In the finals, the band and guard earned grand champion, best musical performance, best visual performance, best general effect and best percussion. Denny McFarland is the band director and assistant directors are Sara Deutschmann and Anna White. Additional marching band staff include Steve White, Herrie Pullon and Mark Ishman. Charlie Bourrage is the color guard director with additional support from Dale Robinson and Erin Shaul. Above, band members are shown with some of their trophies from the invitational. 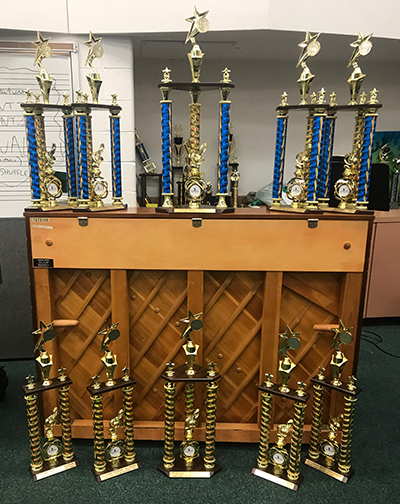 Below, shown are all the trophies won by the band during the regional competition.